As part of his ongoing quest to be king of all media, Neil Gaiman revealed on Twitter that he's currently recording an upcoming guest appearance on The Simpsons. As his Twitpic reveals, a huge portion of The Simpsons budget seems to be going towards creepy topiary versions of America's favorite family these days. "Went to the Marge Simpson Studios. Recorded my part as 'Neil Gaiman', a British author. The accent was the hardest bit to get right." Does this mean he'll join Alan Moore, Daniel Clowes, and Art Spiegelman in the "League of Extraordinary Freelancers"?Gaiman also posted a photo of the episodes' script, entitled The Book Job. 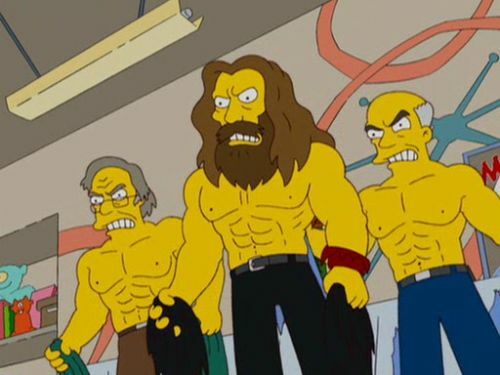 This being latter day Simpsons, one can only assume the episode is a parody of The Italian Job with Homer leading a gang of award-winning authors-turned-safecrackers. The news couldn't have come at a better time for poor Lisa Simpson, considering how uncomfortable she was in the Android's Dungeon, Springfield's resident stereotypical comic book shop, this past Sunday. While Bart attempted to extract information from Comic Book Guy by threatening to ruin a mint-condition copy of Interesting Stories #27 (the first appearance of Radioactive Man), Lisa commented on how difficult it is to be a girl in Comic Book Guy's perpetually-stuck-in-the-'90s shop (Seeing as how Lisa once confessed her love of Ghost World to Clowes, it's safe to say she does most of her comic book shopping in the graphic novel section of Barnes & Noble). Check out The Simpsons's take on the over-the-top sexism still sadly on display in many comic book stores below.